The crisis of neoliberal globalisation has made the issue of sovereignty the centre of contemporary political discourse. If the Left is to conquer post-neoliberal hegemony it has to construct a progressive view of sovereignty. 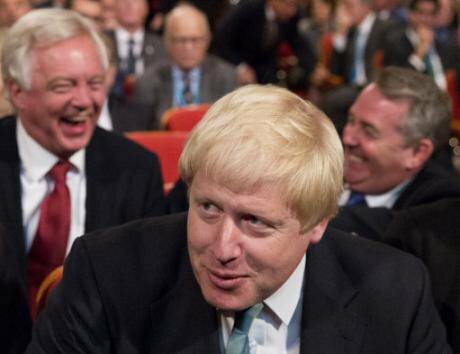 David Davis, Boris Johnson and Liam Fox have a laugh on final day of the Conservative party conference. October, 2016. Isabel Infantes/EMPICS Entertainment. All rights reserved.The crisis of the neoliberal order, which has been spectacularly displayed in the victory of Brexit and the difficulties experienced by Hillary Clinton in the US presidential election campaign, has resuscitated one of the most time-honoured of political notions: the idea of sovereignty. Usually understood as the authority of the state to govern over its own territory, sovereignty had been thought to have been consigned to the dustbin of history in the globally interconnected world of the internet and multinational corporations. But this notion is now almost obsessively invoked by the new populist formations and leaders that have emerged on both the Left and the Right since the 2008 financial crash. The Brexit Leave campaign with its demand to “take back control”, centred on reclaiming sovereignty away from a European Union that was accused of depriving the UK of control over its own borders. The recent decision by the High Court ruling that parliament has to vote on Brexit has led Tory politician David Davis to appeal to popular sovereignty over parliamentary sovereignty declaring that “parliament is sovereign, has been sovereign, but of course the people are sovereign”. Donald Trump’s presidential campaign in the US has made sovereignty its leitmotiv. He has argued that his immigration plan and his proposed overhaul of trade agreements would ensure “America’s prosperity, security, sovereignty." In France, Marine Le Pen pronounces the word “sovereignty” on every available occasion, in the context of tirades against the EU, migration and terrorism. She has declared that this issue will be the centre-piece in her campaign to become the next president of France. In Italy the 5 Star Movement has often appealed to sovereignty, with one of his leaders, Alessandro Di Battista recently declaring that “sovereignty belongs to the People”, and that Italy should abandon the euro to regain control over its economy. However, the question of sovereignty has not been just the preserve of right-wing and centrist formations. Demands for sovereignty have also come from the Left, a camp where this notion had for a long while been looked on with great suspicion, due its association with nationalism and territorial exclusion. In Spain, Podemos’ leader Pablo Iglesias has often described himself as a “soberanista” and has consistently adopted a patriotic discourse, appealing to Spanish history and national pride. While rejecting Brexit, Iglesias has argued that nation-states should recuperate their “sovereign capacity” within the EU. In the US, Bernie Sanders has criticized global finance and, like Donald Trump, global trade. Opposing the Trans-Pacific Partnership (TPP) Sanders has argued that it would “undermine US sovereignty”. The progressive reclaiming of sovereignty can be traced back to the movement of the squares of 2011, comprising the Arab Spring, the Spanish Indignados, the Greek Aganaktismenoi and Occupy Wall Street. While these movements have often been interpreted as “neo-anarchist”, in continuity with the long stream of post-68 anarchist and autonomist movements, one of their defining features was in fact a populist call for sovereignty, and a grassroots reclaiming of political authority away from financial and political elites. Occupy Wall Street assembly resolutions often invoked the “We the People” preamble of the US Constitution, calling for a reclaiming of state institutions by the people and for a control over flows of trade and finance. Similarly in the occupied squares of Spain and Greece, sovereignty was a key issue of discussion about ways to resist the interference of finance and of the European Union, seen as frustrating the people’s will. This abundance of references to sovereignty on both the Right and Left of the political spectrum, thus suggests that sovereignty has become the master-frame of contemporary politics; a discursive and political battleground where the battle for a post-neoliberal hegemony will either be won or lost, and will take either a progressive or regressive direction. This emerging political horizon raises burning questions for the Left, that has so far been lukewarm in embracing this issue. The customary associations of sovereignty customary with nation-state politics, international conflict and repressive control over migration has made many feel that this was a no-go area for progressive politics. However, sovereignty and in particular popular sovereignty has constituted a foundational notion in the development of the modern Left, as seen in the work of Jean-Jacques Rousseau and its influence on the Jacobins and the French revolution. Could the progressive reclaiming of the idea of sovereignty seen in the 2011 protests, and in the discourse of Podemos and Bernie Sanders herald a Left that once again sees sovereignty as the fundamental conceptual basis on which to fight rampant inequality and lack of democracy? What would a progressive politics of sovereignty look like? What forms of sovereignty can be realistically claimed in a globally interconnected world? And to what extent can territorial control and exclusions, which constitute the underlying logic of sovereignty, really be turned towards emancipatory ends? The return en auge of the question of sovereignty in current political debates bespeaks the profound crisis of neoliberalism, and the way its agony and the connected opening of a post-neoliberal horizon, is reviving demands for collective control over politics and society. The financial crisis of 2008, with the resulting social distress for millions has laid bare many underlying contradictions only half-visible in the 1990s and early 2000s, as neoliberalism seemed to triumph the world over. Social anxieties in the post-crash era are particularly focused at a number of flows - of trade, finance, and migration – which constitute the very sinews of the globally interconnected economy. While at the height of neoliberal hegemony, these flows were mostly seen as a source of wealth, in a world of economic stagnation, precarity, geo-political instability and global terrorism, they are increasingly perceived as a source of risks. Hence the demand to “take back control”, launched by the Brexit referendum campaign, as a reaction to a world in which global flows are perceived as undermining all attempts of territorial control. The perception of a loss of control of territorially defined communities over their own destiny reflects the way in which neoliberal globalisation has scientifically demolished all forms of territorial jurisdiction and regulation, hoping to turn the planet into a “smooth space”, to be easily traversed by flows of capital, commodities and services. Sovereignty has indeed been neoliberalism’s sworn enemy, as seen in the frequent attacks waged against this notion in the body of neoclassical economic theory and neoconservative philosophy that informed the development of neoliberalism. Authors such as Ludwig von Mises, Friedrich von Hayek and Milton Friedman have regarded claims to sovereignty as obstacles put in the way of economic exchanges and financial flows, and thus interferences with the primacy of the market and the freedoms of entrepreneurs and consumers. Sovereign states were to be substituted by a global market, the only legimate sovereign according to neoliberalism's Weltanschaung. This blueprint found its concrete application in neoliberal policies of economic and financial deregulation which started to be implemented after the end of the US gold standard and the 1973 oil crisis and triumphed in the 1980s and 1990s. The growth of multinational corporations, acting across national borders and side-stepping nation-state jurisdiction, resulted in blackmailing governments to obtain more favourable employment and tax rules. The creation of tax havens, which went hand in hand with the development of multinationals, was designed as a means to frustrate sovereign control over taxation and capital flows. As described by Nicholas Shaxson in Treasure Islands, tax havens subverted sovereignty by turning it on its head, claiming sovereignty for tiny islands or micro-states, used as pirate coves to hide proceeds stolen from national treasuries. The legal expedients currently used by Internet companies as Google, Facebook and Amazon for tax avoidance, are just the last chapter in this longstanding neoliberal attack against fiscal sovereignty. Additionally trade liberalisation, achieved through a number of global trade treaties and the formation of the World Trade Organisation, also aimed at weakening the sovereignty of nation-states by depriving them of the ability to protect local industries through the use of tariffs and other trade barriers, thus exposing local workers to a global race to the bottom, resulting in falling wages and worsening working conditions. This largely successful attack on the sovereignty of nation-states has facilitated the accumulation of immense wealth by the super-rich at the expense of the many, leading to a situation in which as documented by a famous Oxfam report published in January 2016, 62 individuals control 50% of the world’s wealth. Given these nefarious effects of neoliberalism’s war against sovereignty, it should not come as a surprise, that amidst the crisis of the neoliberal order sovereignty is seen as a necessary principle in devising an alternative political and social order. At the root of this emerging politics of sovereignty stands a yearning for forms of territorial authority that may allow to control those global flows that neoliberalism saw as necessarily virtuous, and that many have come to see as threats to social and economic well-being. However, leftwing and rightwing populists strongly differ in their view of sovereignty and in the understanding of which global flows constitute the real cause of the present lack of democratic control over society and the economy. Soverignty is the point of overlap between leftwing and rightwing brands of anti-establishment populism that have emerged in the post-crash era and which are otherwise at each other opposites. What the discourse of sovereignty of Trump and Sanders, Brexiters and Podemos share in common is the idea that against the gospel of a globalisation of unbridled flows, territorially defined communities have a ‘natural right’ to manage their collective life. This commonality explains why Trump and Sanders have adopted similar positions in respect to global trade. However, the populist Left and Right widely differ in their understanding of what sovereignty actually means. For rightwing and xenophobic populists, sovereignty is first and foremost national sovereignty, the power associated with a national community, often defined along ethnic and isolationist lines and mobilised against external enemies. It is a vision of sovereignty that carries strong overtones of Thomas Hobbes’ philosophy, where the prime mission of politics is to ensure security and protection. The type of global flow this view of sovereignty considers as the biggest threat is evidently migration. The reassertion of sovereignty means in this context closing borders to migrants, including refugees escaping from war, and ostracising undesired internal minorities, and in particular Muslims, suspected of endangering security and social cohesion. This xenophobic elaboration of sovereignty was clearly on display in the Brexit referendum, where the Leave campaign was won by exploiting the fear of migrants seen as responsible for undercutting wages and depleting public services. The progressive vision of sovereignty that lies at the heart of leftwing populist politics from Podemos to Bernie Sanders has a radically different tinge. It lays claim to popular sovereignty above and beyond the narrow conception of national sovereignty, and sees sovereignty as means of inclusion rather than exclusion. The populist Left claim to sovereignty is reminiscent of the early history of the modern Left, between the end of the eighteenth century and the beginning of the nineteenth century when the idea of popular sovereignty constituted a foundational idea for revolutionary and egalitarian politics. While this idea has fallen into disrepute among many progressive movements and thinkers in recent times, as seen for example in the critique of sovereignty by Michael Hardt and Antonio Negri in Empire, the new populist Left of the post-crash era argues that no real democracy is possible without an assertion of democratic forms of territorial authority. The leftist claim to sovereignty, as proposed by the likes of Sanders and Podemos has as its main enemy corporations and banks, not foreigners and refugees. The flows of finance and trade are the ones considered as truly menacing the well-being of territorial communities. In this view sovereignty is conceived as a club to be wielded by the many against the few, by ordinary citizens against the various power elites that are frustrating the people's will by using the disruptive effect of economic flows: bankers, corrupt politicians, lobbyists, and the like, as well as those supranational forces such as the Troika or the IMF all accused of interfering with the people’s will. Furthermore, left-wing populists do not see popular sovereignty as necessarily encased in the nation-state. While leftwing populist leaders as Iglesias and Sanders have often mobilised patriotic sentiments, and have seen the nation as the most important scale of mobilisation, their view of sovereignty is more multi-scale and inclusive than the right-wing one. It encompasses the local, regional, national and continental level. For example in the Spanish context the local governments of Madrid and Barcelona have laid claim to the power of local jurisdiction to protect the local economy against internet companies as Airbnb, overstep national housing laws and offer refuge to migrants. Similarly Bernie Sanders in his support for protestors against the North Dakota Access Pipeline has defended the sovereign rights of Native American communities. It is evident that in the contemporary globally interconnected world, for popular sovereignty to be effective it needs to be exercised also at the international level. The aftermath of Brexit and the harsh economic consequences it is producing is yet another demonstration that in today’s world the attempt by nation-states to go it alone is heading for a bitter defeat. This is why demands to democratise Europe by the DiEM movement led by the former Greek finance minister, Yannis Varoufakis, are so important. A progressive view of sovereignty needs to accept that the nation-state is not the only space for sovereignty, but that in the contemporary world sovereignty operates at different scales which all have their legitimacy, and all can be utilised as a means to pursue progressive political agendas. We live at a time at which the locus of sovereignty is uncertain as last demonstrated by the High Court rule on Brexit. In these times we are called to rethink and reinvent sovereignty to fit the changing contours of territory and institutions. We need to develop an understanding of sovereignty in which territory is not conceived of as a walled-off space, but as a space delimited by porous borders, open to migrants and refugees and closed to speculative capital flows and rogue forms of global trade. The future will tell us which of these visions of sovereignty will prevail in the post-neoliberal landscape and whether it will be leftwing or rightwing populists those who will win the battle for hegemony. At the moment rightwing populists seem to have the upper hand, in the ownership of this idea, partly because of the way in which most people continue to associate sovereignty exclusively with the nation-state, and partly because of the hesitations of the Left in laying claim to sovereignty. What is clear is that the Left cannot allow itself the luxury of leaving the discourse of sovereignty to the Right. Demands for sovereignty spring from all too real experiences of social suffering and humiliation which the neoliberal demolition of sovereign power has unleashed. They have to be carefully listened to. To respond to rage and disarray caused by the economic, political and moral crisis of neoliberalism, the Left urgently needs to construct a progressive view of sovereignty in which territorial control does not mean the exclusion of foreigners, but inclusion of local, national and transnational communities in decisions that affect their collective destiny.